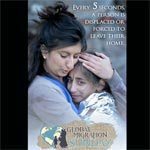 This Sunday, December 3, will be a special Global Migration Sunday, to raise awareness, give support, and pray for refugees and migrants around the world. Whether due to human conflict, persecution, or natural disasters, more than 65 million people have been forcibly displaced from their homes. The United Nations Refugee Agency says that over 21 million of those are refugees, with more than half of them are under the age of eighteen. This Sunday’s offering will give grants and materials to congregations to better equip them to minister to migrants locally and globally. Thomas Kemper, head of the denomination’s General Board of Global Ministries, says the ongoing fund will give migrants food, shelter and health services, as well as the knowledge that others care about them. At least ten percent of the funds raised this Sunday will support refugee resettlement by different denominations through Church World Service. Plenty of resources are available at www.umcmigration.org , including worship liturgies, bulletin inserts, a PowerPoint presentation, webinar, images, and videos. You can give personally to this offering by clicking on Global Migration Advance (#3022144). Sources: Heather Hahn at www.interpretermagazine.org/departments; Julie Dwyer at www.umc.org/news-and-media; and www.umc.org/topics.